Gichamu (ギチャム, Gichamu) is a highly skilled engineer in the Frieza Force. He is known for being the one who made modifications which led to the offensive usage of the scouters. Scouters were invented by the Tuffles, the original inhabitants of Planet Vegeta who were exterminated in Age 730 by the Saiyans. Originally, it was a device for the purpose of guarding against enemies and beasts, but Gichamu laid eyes on it and made modifications for concrete battle power numbers and telecommunications abilities, and soldiers began making use of it to carry out offensives. Scouter - A highly skilled engineer Gichamu was able to modify the Scouters invented by the Tuffles to detect normal ki and read power levels as a concrete number. He also modified them to be used as telecommunications devices capable of communicating across vast distances of space. 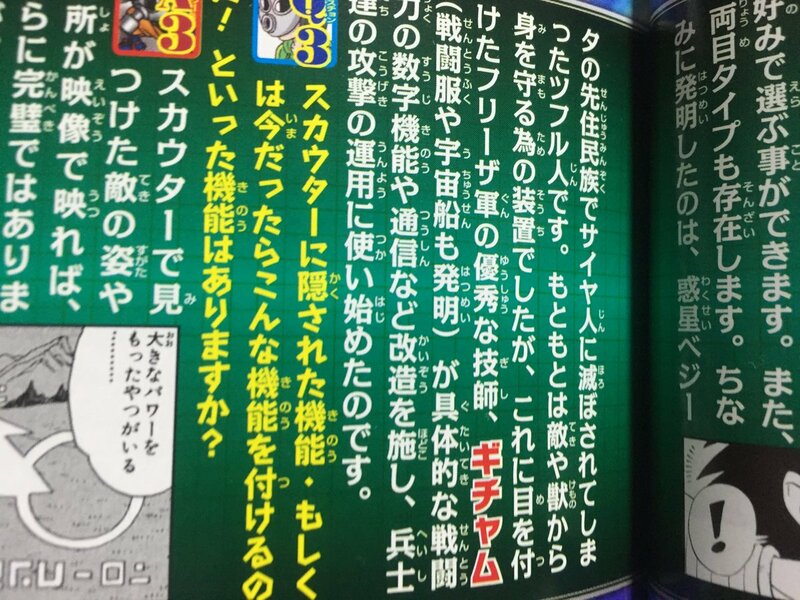 In Dragon Ball Super: Broly, it is Kikono who invented the scouters. ↑ Herms' tweet on the Broly website. Twitter (August 10, 2018).